The Arab world’s poorest and most misunderstood country has been facing multiple crises for years: a shortage of oil and water, a rapidly growing population, hunger, dictatorship, corruption, an international terrorist presence and deep internal regional and political differences. Now escalating regional rivalry between neighbouring Saudi Arabia and Iran has sparked a wider war that threatens chaos and possible collapse. Yemen has been in deep trouble for months, but military intervention led by Saudi Arabia, backed by the US and Britain, marks a new and dangerous stage of its conflict. Last September, after UN-sponsored political dialogue broke down, Houthi rebel fighters from the north took over the capital, Sana’a, and have recently spread out across the country, overthrowing the internationally recognised president Abd-Rabbu Mansour Hadi, who fled first to Aden, and then to Riyadh. Saudi air raids, which began on 26 March, have targeted Houthi air and army bases and weapons. But they have also killed dozens of civilians and led to calls for an immediate ceasefire on humanitarian grounds. Hospitals, homes, schools and civilian infrastructure have been hit, as have airports and power stations. The UN high commissioner for human rights has warned that Yemen is “on the verge of total collapse”. The immediate crisis dates back to Yemen’s chapter of the Arab spring, which in 2011 saw the removal of president Ali Abdullah Saleh, who had ruled the country for 33 years, and famously compared his job to “dancing on the heads of snakes”. The Saudis and their Gulf allies, supported by the west, oversaw a political transition that brought in Hadi as president. That temporarily avoided civil war but failed to introduce more fundamental changes, as Saleh (who was given immunity from prosecution) continued to manoeuvre behind the scenes. Hadi’s attempts to reform the military also backfired badly. The Houthis, who call themselves Ansar Allah (“supporters of Allah”), belong to the Zaydi sect of Shia Islam (who represent 20-30% of Yemen’s population). Most experts say the conflict is fundamentally about power and resources rather than sectarian confrontation. From 2004, the Houthis fought Saleh, partly to resist growing Saudi influence and also because they opposed his close relationship with the US during the post-2001 “war on terror”. Today, however, Saleh is said to be backing the Houthis, perhaps as a way of eventually giving power to his son, Ahmad Ali, and weakening his enemies. But Iranian support for the rebels – the extent of which is unclear – has fed into wider Saudi anxieties about Tehran’s influence in the Gulf, at a time when it is making advances in Iraq, Syria and Lebanon. The Saudis and their Sunni allies – Turkey, Egypt, Qatar and the UAE – all see Yemen through the prism of strategic rivalry with Tehran and Shia-Sunni competition as they fret about an American withdrawal from the Gulf and rapprochement with Iran. The declared aim of Operation Decisive Storm is to “protect Yemen and its people from the aggression of the Houthi militias that are supported by regional powers whose goal is to establish hegemony over Yemen and to make it a base for its influence in the region”. Pakistan is also considering sending forces. Iran has condemned the operation. The big question is whether the Saudi-led intervention will make things better or worse. Most experts predict the latter, unless bombing can be used as a way of pressuring the Houthis. Negotiations, however, would clearly be difficult. The Saudis are demanding the Houthis withdraw from all areas they have taken from Sana’a southward, disarmament and Hadi’s reinstatement. 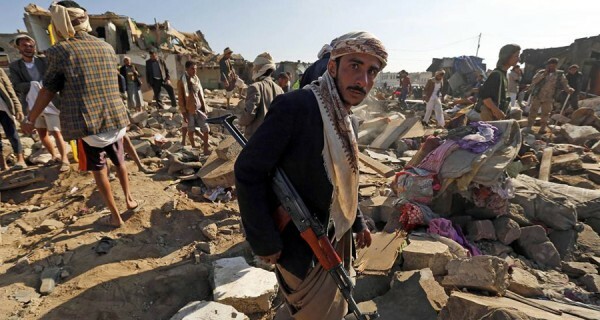 “The immediate reactions of Houthi leaders to the Saudi-led air strikes have been resolute, expressing a strong determination to continue fighting and to make the neighbouring kingdom pay a heavy price for its actions,” commented the Yemeni political scientist Gamal Gasim. Linked to that is the looming question of whether the Saudis will commit ground troops. The Aden area, where the Egyptian navy has also been in action, is a major concern. The Saudi intervention against the Houthis in late 2009 stopped short of sustained cross-border ground operations and failed to suppress the insurgency. The risk is that deeper Saudi involvement will push the Iranians to follow suit, giving the conflict even more of a proxy character. Yemen experienced that in the 1960s, when Nasser’s Egypt and Saudi Arabia backed different sides in its civil war, almost certainly prolonging it. The military option, analysts argue, needs to give way to renewed efforts, with international backing, to share power peacefully, making constitutional amendments and holding elections. The alternative is further destruction, misery and radicalisation that will only benefit the most extreme elements in Yemen and fuel wider instability. “Neither Saudi Arabia, nor Iran, nor the United States nor, to state the obvious, Yemenis, stand to gain from an extended armed conflict,” argues Adam Baron of the European Council on Foreign Relations.